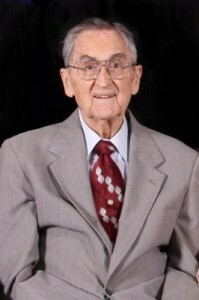 Pastor Russell M. Ward, age 96 of Englewood, Ohio, went to be with the Lord he loved and served for over 60 years on December 29, 2010. Ward was born in Indiana, but was raised in Illinois. He was the second of three sons of the late Audrey and William Ward. As a young man, he traveled widely with the “American Back to God” Quartet, and later with the Grace Seminary Quartet. He sang with and was the speaker for both groups. Russell was a graduate of Moody Bible Institute in Chicago and Grace Theological Seminary in Winona Lake, Indiana. His first pastorate was at the Grace Brethren Church of Cuyahoga Falls, Ohio, and it was there that he met and married “D.D.” Braucher. They then served together there and in Cleveland (Lyndhurst), North Riverdale Grace Brethren Church of Dayton, and he was the founding Pastor of Basore Road Grace Brethren Church of Dayton, where they served happily for 26 years. He was a man of God whose life touched many others by his example of the Christian life of a man, pastor, husband and father. He is survived by his wife of 62 years: D.D. (Braucher) Ward , and their five children: Ruthanne (James) Risser of Dayton, Janice (Skip) White of Englewood, Barbara (Dan) Downs of Brookville, Katie (Tim) Vanderhorst of Huber Heights, Scott Ward of Richmond, Virginia and 12 grandchildren, 7 great grandchildren, relatives and friends. He was preceded in death by his brothers: Charles and Albert Ward. The family wishes to especially express profound appreciation to the aides and nurses: Laura, Shearon, Mary Lynne, Sue, Kim and Tasha and Chaplain Lee of Crossroads Hospice who served our husband and father so very well with loving care.